Having recently returned from a four-year sojourn in eastern India, where she had been sent by Dippy Dave's Meathouse to manage their vegan restaurants, Mamie set to the task of writing her Aunt Daisy on her glorious adventures when she realized, much to her dismay, that she'd already exceeded her daily limit of exclamation marks. Click to buy Susie Shorts! 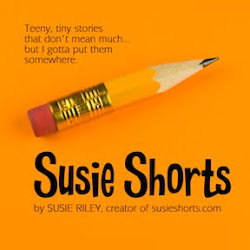 Click HERE to can get your own copy of SUSIE SHORTS on iTUNES! Susie is a writer and marketing communications specialist who resides in the San Diego area along with her husband and two silly bassets. When not working or blogging, she perpetually searches for the ultimate brownie recipe, also finding time to master the harmonica and tend to her 390-plus-piece collection of plastic windup toys. Copyright 2011-2013 Susie Riley. All rights reserved. Simple theme. Theme images by chuwy. Powered by Blogger.